If you’re currently relying on an outdated video conferencing solution - or if you don’t have one at all - you’re in luck. While any time is a good time to invest in video conferencing, Q4 may be the best. One big reason is that Q4 is when you can get the best deals, but there are also other important factors like increased access to seasonal employees. 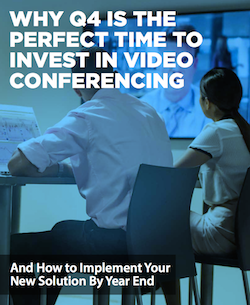 To learn more, read this guide on Why Q4 is the Perfect Time to Invest in Video Conferencing. It also shows how to implement you new solution before the year’s end.